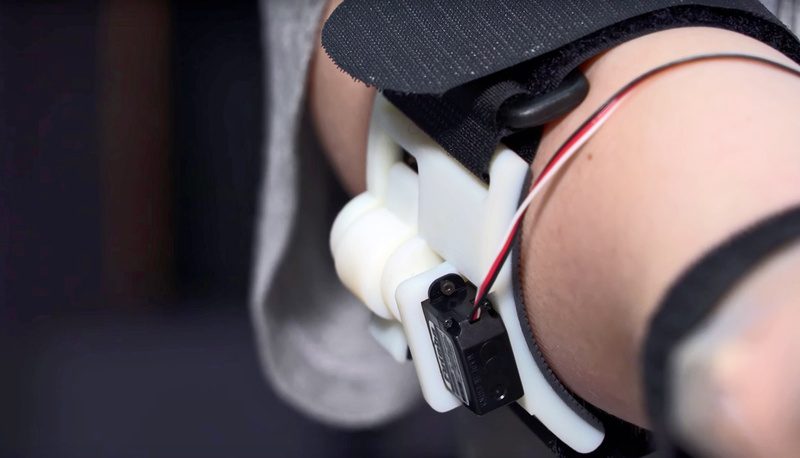 Tactile feedback on the skin doubled the ability of blindfolded users of a prosthetic hand to discern the size of objects they picked up. In a new paper to be presented June 7 at the World Haptics 2017 conference in Fürstenfeldbruck, Germany, O’Malley and colleagues demonstrate that 18 non-amputee test subjects performed significantly better on size-discrimination tests with a prosthetic hand when they received haptic feedback from a simple skin-stretch device on the upper arm. The study is the first to test a prosthesis in combination with a skin-stretch rocking device for proprioception. An estimated 1.7 million people in the US live with the loss of a limb. Traditional prostheses restore some day-to-day function, but very few provide sensory feedback. For the most part, an amputee today must see their prosthesis to properly operate it. Like the Rice Haptic Rocker, the SoftHand uses a simple design. Co-creator Manuel Catalano, a postdoctoral research scientist at IIT/Pisa, says the design inspiration comes from neuroscience. Battaglia says neurological studies have identified a set of synergies for the hand. People use these alone or in combination to perform tasks as simple as turning a doorknob and as complex as playing the piano. Grasping an object, like a cup or a coat hanger, is one of the simplest. For the size-discrimination test, subjects wore blindfolds while grasping two different objects. Researchers then asked them which of the two was larger. Without haptic feedback, the blindfolded subjects had to base their guesses on intuition. They chose correctly only about 33 percent of the time, which is what one would expect from a random choice. When they performed the same tests with feedback from the Rice Haptic Rocker, the subjects correctly distinguished the larger from smaller objects more than 70 percent of the time. The National Science Foundation and the European projects WEARHAP, SOFTPRO, and SoftHands supported the work.